Introduced in 1925 at the Exposition Internationale des Arts Decoratifs et Industriels Modernes in Paris, the term “Art Deco” was coined in the 1960’s as an all-encompassing decorative movement that flourished internationally throughout the 1920’s and into the second World War. 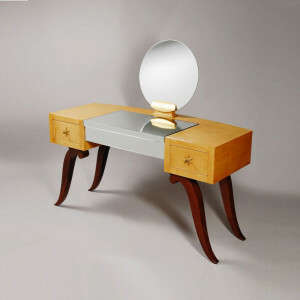 At its height, Art Deco became synonymous with a simple elegance and functional luxury that was distinctly modern. 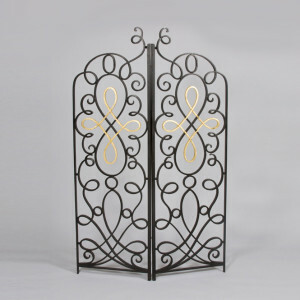 The style’s linear symmetry was a distinct departure from the organic forms and curves of Art Nouveau, and it embraced influences from many different styles of the early 20th century, including Neoclassical, Constructivism, Cubism, Modernism, and Futurism. 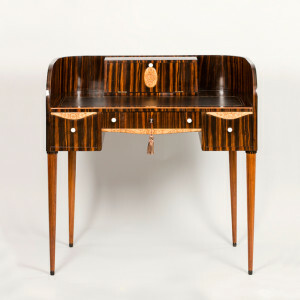 Early Art Deco (1914-1926) was noted for its luxurious and highly detailed pieces of furniture and decorative arts characterized by sumptuous materials, elegance in design, and the use of rare woods in tandem with ivory inlays, often employing intricate sculpting and gilding techniques. Aesthetics were preeminent in the early movement, with apparently little regard paid to cost of production. At the forefront of the early style were designers like J-E Ruhlmann, Leon Jallot, Paul Follot, Süe et Mare, Maurice Dufrene, Dominique and Leleu, who considered themselves torch-bearers in the legacy of three centuries of fine French furniture designer. 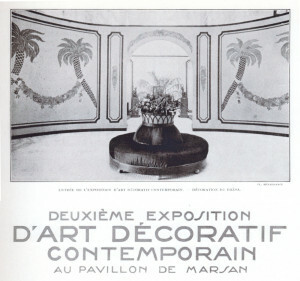 Many of these designers worked primarily on a private commission basis, creating unique works for specific installations, although some had production venues available to the general public through Paris department stores like Les Galeries Lafayette, Au Printemps, Au Louvre and Au Bon Marché. The Modernist movement of the late 1920’s to mid 1930’s was inspired by a group of young reactionary designers who were put off by the lavish approach of the more traditional oeuvre presented at the 1925 Exposition Internationale. The Union des Artistes Modernes (UAM), formed in 1929, was searching for universality in design and developed an austere cannon based on the absence of decoration or ornamentation. Simplicity of line, shape and function were paramount. Architect/designer Jacques Adnet, one of the earliest Modernists, had been espousing the simple beauty of combining wood, metal and glass in furniture design as early as 1925. The UAM included artists, designers, architects and sculptors, and by 1932 had more than sixty members including Pierre Chareau, Eileen Gray and André Lurcat. In addition to these rebel Modernists, a number of the more traditional-style designers participated in the movement, including Maurice Dufrene and Jules Leleu, who each developed a Modernist style of his own. 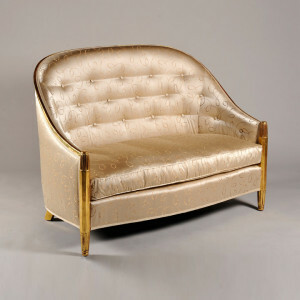 The Modernist movement reached its height during the difficult years of the Great Depression, when exotic materials became cost prohibitive, and demand for the opulent creations of early French Deco had waned. By the late 1930’s, the artist’s eye for spare lines and absence of decoration had begun to fatigue. Though the Modernist aesthetic continued to be a major influence throughout the 20th Century, the late 1930’s and 1940’s saw a return to the appeal of decoration and ornamentation as integral aspects of design. Exuberant new French designers like Andre Arbus exhibited at the Paris Exposition Internationale des Arts et Techniques dans la vie Moderne in 1937 with their new vision deploying an array of lavish decorative elements, including an extravagant use of gilt iron, draped fabrics, parchments, and a general return to exotic materials and daring design. 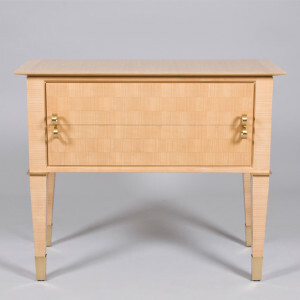 The second World War interrupted much of the production of fine furniture, and the post-war period saw the completion of many commissions that were begun in the late 1930’s. The late 1940’s would see the demise of the studio system, under which superb French furniture had been created for almost three centuries; the concept of the designer/artist with their atelier of master craftsmen and journeymen became creatively and financially unfeasible. The post-war rise of a new middle class saw a shift to the production of large quantities of machine-made furniture to satisfy the public’s insatiable demand, a demand primarily fueled by a desire to rebuild after the devastations of war.